It has always been a challenge keeping the auxiliary battery in a dual battery system fully charged. With so many different battery types available and variable voltage charging systems becoming common on newer vehicles, keeping the auxiliary battery fully charged has become even more complex. 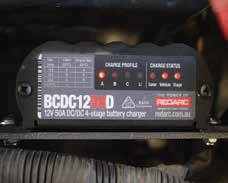 Undercharging or overcharging are the prime reasons for batteries failing so, in order to extend the life of an auxiliary battery, you need to charge it just right. 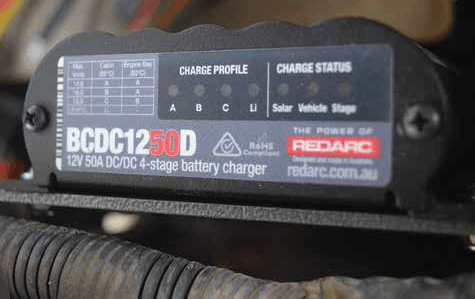 In-vehicle battery chargers are fast becoming the easiest and simplest way to do this and the BCDC1250D dual In-vehicle battery charger from REDARC is the new heavy hitter when it comes to battery charging with a maximum output of 50A. This charger features technology designed to charge auxiliary batteries to 100 percent regardless of their type or size including Lithium batteries. Unlike other DC-DC chargers on the market, the BCDC1250D will operate down to input voltages as low as 9 Volts. The charger also incorporates a Maximum Power Point Tracking (MPPT) solar regulator allowing dual input charging from both solar and the alternator simultaneously with Green Power Priority meaning less load on the alternator. If you’re thinking of adding solar panels to your vehicle, having the solar regulator already built into the charger will save you money down the track. For this tool test, the BCDC1250D was installed into a Toyota Hilux with a dual battery system separated by a voltage sensitive battery isolator. Both batteries were a lead-acid type with the auxiliary battery being deep cycle. The charger is installer-friendly with clear instructions and online technical assistance if required Installation location is important as the unit requires good airflow with an optimal engine bay operating temp of 55°C. For testing, the charger was installed behind the headlight assembly using a universal mounting bracket found online. Be sure to install the charger so that the 7 LEDs on the display screen are visible. The charger comes with a set of cable connectors and heat shrink, you will need your own hardware to make up a harness to suit the battery layout in your vehicle. For the test installation, I also used REDARC’s FK60 60A fuse kit as recommended by REDARC. With two simple wiring connections, you can select the trigger type being either standard or low voltage and the charging profile. The charger incorporates several different charging profiles so be sure to follow the instructions and check your manufacturer and battery requirements prior to setting up the charger. If you do have a hiccup with the installation, battery or solar panel, the charger has an error code function. The LEDs will flash indicating what the fault is – a great feature to take the guess work out of diagnosing faults. After our test installation and a few test cycles, there was a significant improvement in the health of the auxiliary battery compared with the previous charging system. The BCDC1250D 50A Dual Input In-Vehicle battery charger from REDARC is one intelligent heavy hitting DC-DC charger that will keep your batteries charged so you’ll always be ready for your next adventure.